NEW YORK — Alex Rodriguez delivered a game-winning two-run homer off Junichi Tazawa in the bottom of the 15th inning as the Yankees defeated the Red Sox, 2-0, in what can only be considered an instant Yankee Stadium classic. Derek Jeter led off the frame with a bloop single into shallow right-center, and after a pair of outs, Rodriguez ended a career-high 72 at-bat homerless streak in his seventh plate appearance of the evening, driving in the only runs of the night with a rocket into the left-center-field bullpen. The early-morning push came after J.D. Drew made a sensational catch to prolong the game in the 14th, and authored a finish to a contest that — through seven innings — featured an epic duel between A.J. Burnett and Josh Beckett. The former teammates littered the scoreboard with zeroes, making August feel an awful lot like October. Burnett allowed a single to the first batter he faced, Jacoby Ellsbury, on a ball that fell just shy of Nick Swisher’s diving grasp in right field. That was it, as Burnett clamped the Red Sox quiet with 7 2/3 innings of scoreless ball as he turned in arguably his best performance since signing with the Yankees. He worked out of damage with the help of timely defense and big pitches — twice inducing double plays and pitching out of a two-on, none-out jam in the sixth. Burnett walked Ellsbury with his 118th and final pitch, walking off the field to a loud standing ovation from the sellout crowd of 48,262. Ellsbury stole second base on a pitchout, moving the potential go-ahead run into second position, but Phil Hughes exhaled as Dustin Pedroia flied out to deep center, ending the inning. Mariano Rivera came on and worked the ninth inning against the heart of the Red Sox’s lineup, and Alfredo Aceves hurled three scoreless innings, allowing Brian Bruney and Phil Coke to set up the classic finish. On the Boston side, Beckett showcased some of his sharpest stuff of the campaign, limiting the Yankees to four hits through seven innings and facing the minimum through the first four frames, walking two and striking out seven in a 115-pitch performance. Hideki Okajima recorded four outs and Daniel Bard pitched out of trouble in the ninth before Jonathan Papelbon, Manny Delcarmen and Takashi Saito moved the game on to Tazawa. It feels GREAT to be up ahead of the Sox by 4.5 games at the start of August. I LOVE IT! ….and boy have we missed him! Now, lets hope the team can build on today’s awesome win and build up that momentum again! =) Enough of this minor league play they’ve been playing. Get it together! I have been so bad with updating my blog lately that, although number 54 is not as high as i would love to be, it feels good to know that i have not been forgotten around these parts =). This used to be my constant daily “hangout” spot, where i made some cool acquaintances like me who love to talk about baseball and we would do just that all day. In other news, i have finally adjusted to working in NJ, and have been lucky to have found a network of co-workers who are fellow Yankees fanatics like me :-D. We have a listserv that we comment on daily and its fun to have that Yankee community again! Thanks to them, working in NJ has been a lil less “frustrating” when it comes to the Yankees. I am very happy about the signing of CC, although i could have done without the dramatics that preceded it. But the Yankees needed pitching and i felt he was definitely the best option that we had. He along with A.J. Burnett would add the missing piece of the puzzle that we needed to complete for pitching. Now i patiently await to find out if Teixiera (yes yes yes please) and/or Manny (eeer, not feeling it) will be in pinstripes come opening day. And please God, let Andy Pettitte just take the offer already!!!!!!!! Andy, i love you, but seriously, which team is going to take you for higher than that? $10 M in this economy and you are saying no? Uhmmm… bro, just take it and end your career with dignity, as a Yankee, the way its supposed to be. I really hope he takes it. I will always have an extremely soft spot in my heart for Andy, and would love to see him end his career in the stripes! I am still heeling from that whole Astros stint, and dont think i can stand to see him in another uniform again! Who’s going for opening Day? 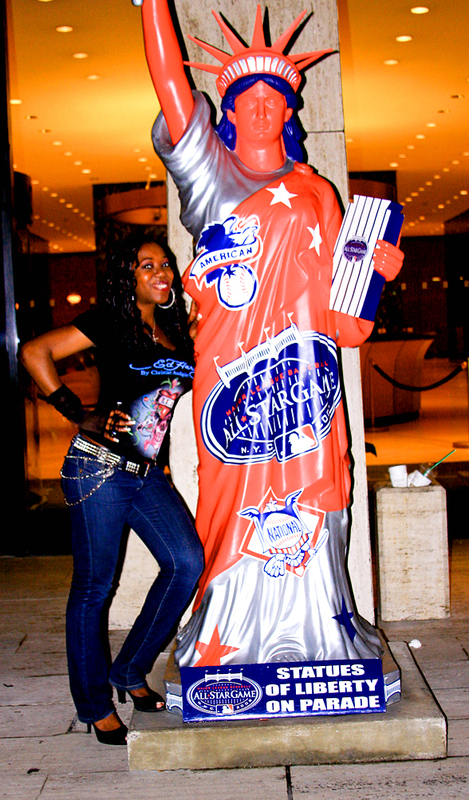 I mean, i love Jersey and all, but i miss everything about working in NY…. working on Wall Street, the atmosphere in midtown, hot dog stands, a pret-a-manger on every corner, more than 3 lunchtime options (which is what i currently have, lol), happy hours with co-workers, inifinite shopping options, and MOST IMPORTANTLY, being able to go to Yankees games after work during the week. That is DEFINITELY what i miss the most about working in the city. In fact, it almost made or break my decision. But you know…the yankees don’t pay my salary, my student loans, or put gas in my tank, lol. I’ll miss the bright lights when you first come into the arena, the feeling of adrenaline when the starters are announced, gametime and all the corny “ball under cap games” we get to play in between innings, the stupid wave that was always bound to erupt, the stomping feet calling for a rally, the feeling of euphoria when a Yankee slugs one out the park, the rush that i feel when i hear Enter Sandman and know that Mo’s about to shut it DOWN, even hi-fiving complete strangers after the game and even congratulating ourselves for a “good game” like we had anything to do with the scoreboard, LOL. Anywhoo, i have to head off to work now, but just wanted to check in and yap away. The next blog will be completely baseball related, i promise 😉 Just wanted to check in on a personal tip prior. Speaking of which, GO GO GO NOW, GO VOTE FOR GIAMBI AS THE FINAL VOTE!!! PS. Great game last night. How about that kid Justin Christian stealing 3rd like that? Gutsy and daring move…i love him already =). – Josh Hamilton…amazing story. Coming from where he was to where he is now… wow… God bless him. I am happy for him being a starter…. – Its the summer time and the Yankees are currently 5 million games behind first. What else is new? Its like we are addicted to playing catch up in September. – And the Devil Rays??? Really? Where did that come from??? This year has been bananas. There’s no possible way i imagined that going into the All Star game, the D-Rays would be anywhere other than last place. Today/yesterday has had to be one of the most depressing days for true baseball fans everywhere, irregardless of what team you support. 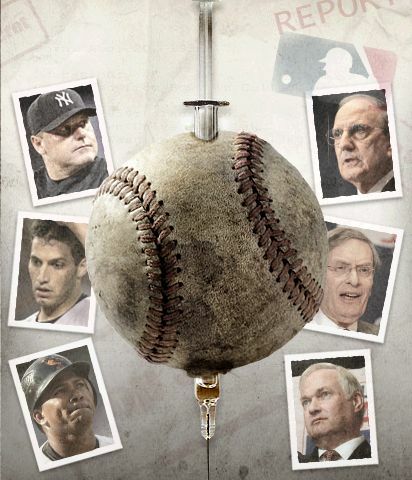 But for me especially, having my favorite pitcher EVER, Andy Pettitte, be implicated by the Mitchell investigation has been a bit too much for me to swallow : (. 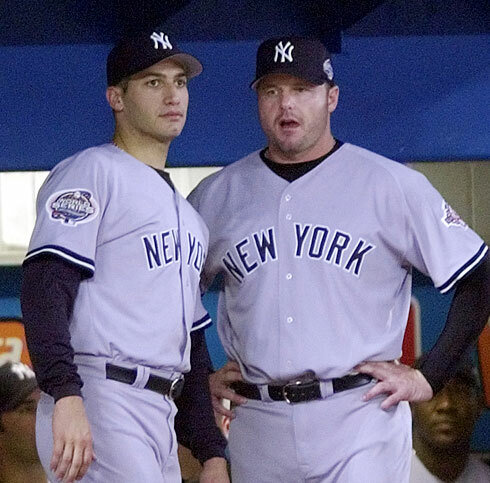 Andy Pettitte and Roger Clemens. At this time yesterday, i was getting ready to celebrate the fact that my current favorite player Alex Rodriguez, was going to be signing a record breaking contract 10yr / $275 million contract with my favorite team, and I was going to be in baseball heaven. I mean, what better way to cap off the drama that had been the New York Yankees since our 1st round demise from the post season for the second year in a row? In October…it seemed like being a Yankee fan had to be the most depressing thing in the world…everything was falling apart. Our beloved manager, Joe Torre, left us to go to our rival, The Dodgers…our best hitter, A-Rod opts out of his contract during the world series…we didnt know if Mo, Jorge or Andy would be back…and everything was just in disarray for us yet again. But then everything started coming together. We got a new manager we actually love. Each player we had questions about re-signed back with the team, we were in active pursuit of some pretty good pitchers, and as a fabulous cherry on top our best hitter and the greatest player in baseball, was going to be a Yankee for what seemed like forever (10yrs)…and all was right with the world. I was breathing a sigh of relief again, and felt like i was back in at least, partial baseball heaven. Honestly…I dont even know what to feel at this point. On one hand, i want to say that the Mitchell investigation is bulls*t. To gather vocal testimony from two men facing a criminal conviction, and possibly with hidden agendas of their own, with no possibility of them being cross examined, sounds like a load of crap! But then on the other hand…i’ve been reading this report…(and holy smokes is this crap long…and oh, should i mention quite “juvenile”…come on…millions was spent on this, and yet this is what we get? Even lowly analyst i can write a waaaayyy better report than this!! And i wont charge more than five hundred thousand!! )…and well, the evidence against some, especially Roger Clemens is quite damning. I dont know if i can really throw this out the window as c r a p…some of this stuff sounds too real to be made up. And i am really sad about Roger ….I mean…i’ve not been the hugest Roger Clemens fan in the world, but I’ve always recognized and praised the man as the greatest pitcher of my era. And now for this to come out…i mean, even if some of this isnt true (and i’m sure not all of it is), his reputation, much like Barry Bonds’, will be forever tainted by this. As a great fan of the great sport of baseball, to watch both the greatest hitter and pitcher of my generation “go down” in such fashion, is ultimately the most depressing thing i have had to endure as a baseball and probably overall, sports fan. As for Andy…he seems to only be implicated for one season..the 2002 season. He’s never tested positive for any of that stuff, and its been 5 years now, so there’s no way to really have concrete proof. Call this hypocritical, BUT, i have absolutely no love lost for him. Even if the whole world points fingers at him and calls him guilty, without a positive test result in front of me, i will still have his back. He still remains …my beloved Andy Pettitte. But then again…I know MLB is not alone. The NFL and the NBA are right there with us… its a sad day in sports in general. I’m off from work today, and i was supposed to be studying for GMATs…but I dont think i will really be able to do much of that today…I’ve been glued to ESPN/YES/Sportscenter/mlb.com/baseball blogs around the web all morning, and i dont see that changing anytime soon…even though i must say, ESPN analysts make me sick and i am tired of hearing their “expert” analysis (especially Steve Phillips…i cant stand his guts! ), but still, i cant seem to stop watching… maybe I’ll soon get so sick of it i wont be able to bear the sound of their voice…but for now, i’m glued in.